Stephen Roudschtein Blog posts are personal opinions and do not necessarily reflect Stop Designer Babies’ position. The key framing of the story of the announcement of the birth of the first GM babies, was the classic ‘rogue scientist’ trope, beloved of cartoon writers. Much of He Jiankui’s behaviour, including secrecy and forging ethical review documents undoubtedly fits that pattern. But if you scratch the surface, it soon becomes clear that there is much more than one bad apple that is rotten in science. By condemning him, the scientific institutions try to make themselves look responsible. In fact, they prepared the ground for him, in many ways and must take the blame for that. As with the Catholic church, the ‘bad apples’ commit crimes because they have the confidence that comes from being part of institutions with vast social power and prestige. In essence, from the point of view of the scientific institutions, He Jiankui did what those characters in comedies do, who say, “Oh my God! Did I just say that out loud! ?” As a result, the world has woken up to the fact that consumer eugenics is not some science-fiction scenario, it’s real, here and now. The strategy of the scientific institutions was meant to be a replay of their now well-established technocratic method of engineering public ‘consent’ for each new technology they want to introduce. In the usual run of things, first some new scientific or technological development happens. Then bioethicists produce reports saying that although the new technology challenges existing morality, cultural norms, and might have harmful social consequences etc., it should be allowed to go ahead in the name of scientific progress and consumer choice. Third, a well-funded and thoroughly mendacious PR campaign is launched around a ‘public consultation’ process, in which the questions asked are designed to get the answer desired. In the course of this ‘public debate’, families with medical problems are pushed in front of the media. This frames the issue as Scientific Progress and Medical Benevolence versus (preferably religious/pro-life) irrational and uncaring naysayers. Finally, in a few brief hours of debate, parliaments pass the desired legislation. 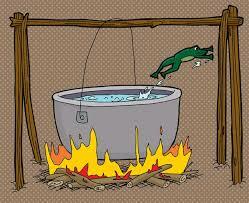 Normally, the procedure follows the story of the man who boils a frog (i.e. 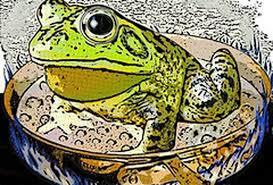 you and me) alive: why doesn’t the frog jump out o f the pan? Because it is being heated so gradually that it never notices what is going on, it can never find the moment to jump. In the case of human genetic engineering the scientific institutions had to be careful. This issue has, for many years, been regarded as the most sensitive of all bioethical issues, the hottest of hot potatoes. That is why governments in nearly every industrialised country have actually banned it. It is, to say the least, highly unusual for governments to rule out certain areas of technological development before they are even feasible – there would have to be very good reasons for that. The reason here, the enormous elephant in the room that geneticists and bioethicists don’t like to talk about, is the history of eugenics in the 20th century, the atrocities committed by geneticists and others in the name of ‘improving the human race’. The technocrats knew that, if they were not careful, they might come unstuck in the same way that they did over GM food in Europe, in the late 1990s. They would have to boil us very slowly. Accordingly, this time the scientific establishment began more carefully, with an ‘international summit’ of scientists in late 2015 in Washington DC. Of course, no representatives of civil society were asked to speak. The final statement of that summit, which was supposed to be the international consensus about how to proceed in this area, acknowledged the great sensitivity and importance of this issue. So, we were reassured, nothing would move ahead until a process of creating a ‘broad societal consensus’ had been gone through. Unfortunately, no-one knew what a process for creating broad societal consensus would look like, and no-one bothered to think about it much. Instead, the technocratic machinery moved into gear, the accelerator was pressed, it was business as usual. Little more than a year after the 2015 summit, the US National Academy of Science (NAS) produced a report saying that human genetic modification, for the purposes of preventing genetic disease would be ethically acceptable. In 2018, a scientist-dominated panel convened by the UK-based Nuffield Council on Bioethics, took the further unprecedented step, so far only taken by transhumanists and other self-declared eugenicists. In its wisdom, it decided that even genetically-‘enhanced’ designer babies could be ethically acceptable. Thus, in less than three years, in a period when more and more evidence accrued that the new technology was not ready, the scientific institutions moved from tentative reassurance to full steam ahead. In ethically justifying what he did, He Jiankui said that he took the NAS report as a green light to proceed. Those Western scientists who condemn him and pretend to be so much more responsible, trained him and showed him the way. Which bit of NO! did you not understand? What this sad story shows is that even our august and sober scientific and ethical institutions cannot restrain their enthusiasm for technological conquest. They could not, even when they really needed to, wait just a little longer. For the truth is that, if you push almost any scientist hard enough, they will admit that they simply do not accept democratic control of science and technology. The very concept just doesn’t make sense in their technocratic worldview, in which they see themselves bravely striding forward to save humanity through technology. They are the good guys after all, aren’t they? How could anybody argue with ‘progress through technology’? We have heard enough of this from the Silicon Valley superheroes and their techno-fixes for everything to recognise it by now. This is the scientific credo, no matter how well they can mouth the currently required phrase ‘Responsible Research and Innovation’. Most scientists simply reject the idea that people have any right to say NO! To what they’re doing. Even though we pay their salaries, fund their research and have set up the nice universities where they work. No matter how little medical benefit there may be, no matter how great the risks to society, they simply MUST push ahead. Unfortunately, the bit of NO they don’t understand is all of it. Accordingly, in the neoliberal era, in the age of ‘Move Fast and Break Things’ (i.e. people, communities, whole societies), bioethics has become largely a matter of showing why accepted moral principles and social norms are no longer relevant. All must bow down to the Gods of profit, consumer autonomy and ‘progress through technology’. Even the demonstrated social catastrophe of eugenics cannot be allowed to get in the way. He Jiankui lifted the veil on all this and showed us what technocracy looks like. The Hong Kong summit in November 2018 was intended to consolidate the shift from ‘waiting for societal consensus’ to ‘paying attention to social concerns’ (!). Although they had already turned up the heat on the frog too fast, they were certainly not going to listen to civil society calls for a moratorium. They would probably have got away with it, had it not been for He Jiankui, who turned the heat under the frog right up to boiling point. Now it’s jumping; what happens next is up to you. Let’s see what democracy looks like.